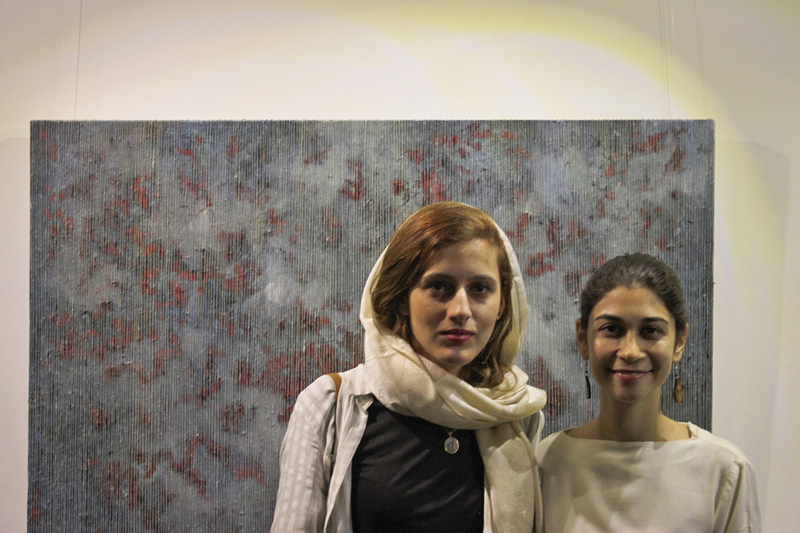 In a joint exhibition titled Transition of Tradition, artists Marjan Baniasadi and Anushka Rustomji explore the constantly evolving nature of traditions and their transformative effect on those who practice them. Monday, the 23rd April 2018, was an unusual day for an exhibition, a foreshadow of what was to be experienced at Transition of Tradition. 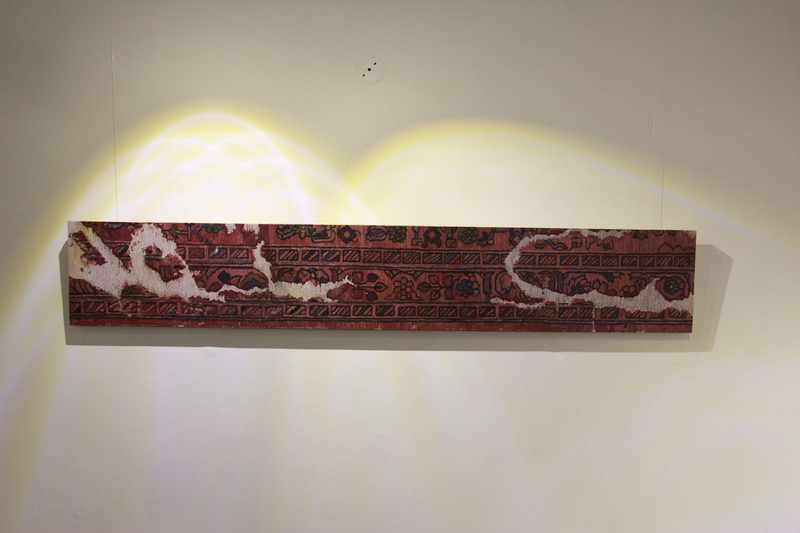 As you enter Lahore’s Taseer Art Gallery, your eye immediately catches Marjan Baniasadi’s piece. 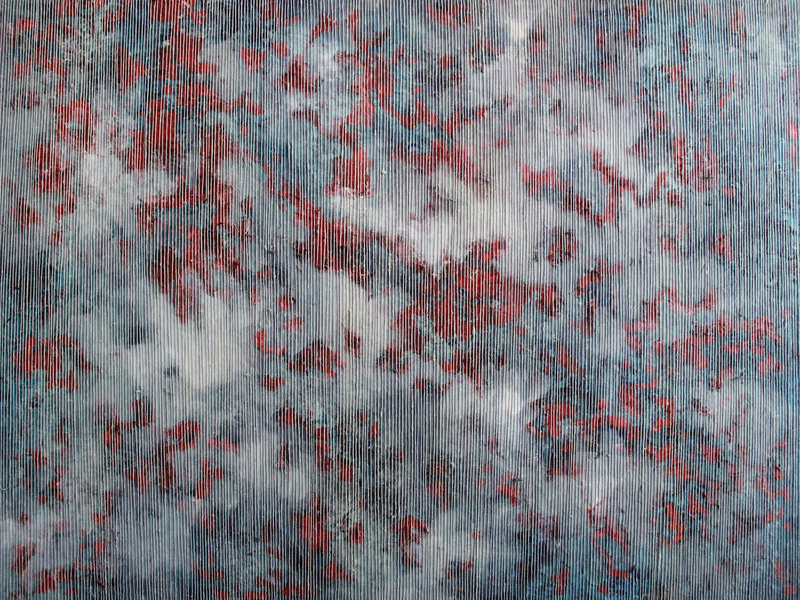 It has a warm, welcoming feel, emanating particularly from the colour palette. What at first glance looks like a fragment of carpet stretched out is in fact a painted canvas interwoven with woollen threads. This creates not only a most wonderful illusion but also an allusion to the basic theme at large. The work reminds you of cosy homes rich with handwoven carpets. While each image is complete in itself, the overall aura contains a sense of curiosity; it makes you feel as if you are looking at a piece of a larger puzzle. The attractive quality behind her work is that complete yet incomplete desire. The hazy image makes you want to look closer and find the clues; find the bigger picture. Between the landscapes and motifs there is a hidden story waiting to be deciphered. After much introspection you realize that what you feel is actually nostalgia. Her work is like a mirror that looks at the past but within the new frame of contemporary art. A transition of tradition is at play. While Marjan’s pieces operate at a subconscious level, building subtle layers, Anushka Rustomji’s display has a more headstrong approach. She uses foreign yet familiar signs and symbols throughout her work with the use of ancient Eastern and Zoroastrian imagery. These images instantly leave an impression of the “historic”; of a time that has passed. Ancient symbols are recreated in new ways through new patterns. These ideas have been showcased in a variety of forms in Anushka’s case; with paintings on archival paper, images made though punctures on galvanized steel and through embossed archival paper. 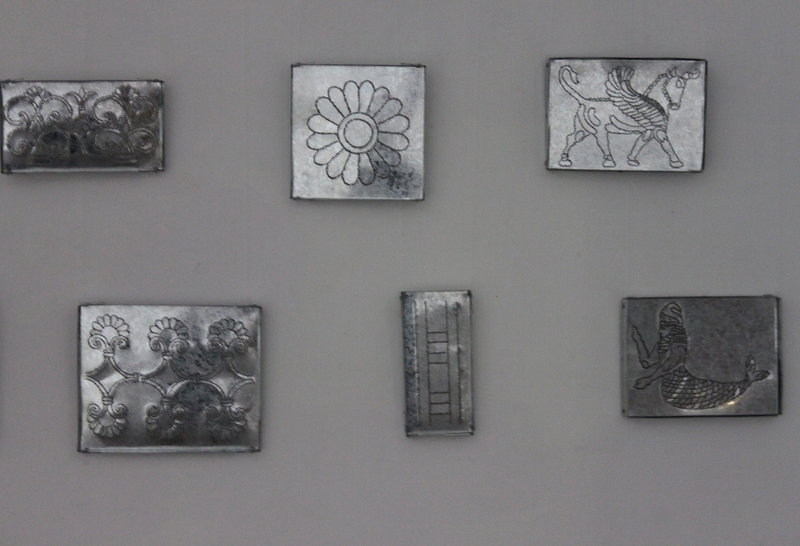 Each of the steel items has a different image that looks like a remnant of the past; something that was once upon a time used to make hieroglyphs and was the essential alphabet in keeping record. The images look like stencils and could possibly be part of a Pakistani truck’s ornamentation. Both of these references are related to practices that have slowly been taken over by technology – just like the symbols/images that were replaced by the alphabet and new storytelling techniques. Again, a transition is at work and old traditions are evolving. Marjan’s and Anushka’s subject matters diverge and complement one another while at the same time carry opposite feels. Marjan’s warmth differs from Anushka’s fresh, cool approach. Anushka’s pieces don’t imply a mysterious vibes of untold stories as do Marjan’s, rather they are a unique approach to new ideas from an old language. It’s like she’s telling new tales of forgotten times. In all forms there is similar imagery. A collaboration by the two artists is what really brought their work together. 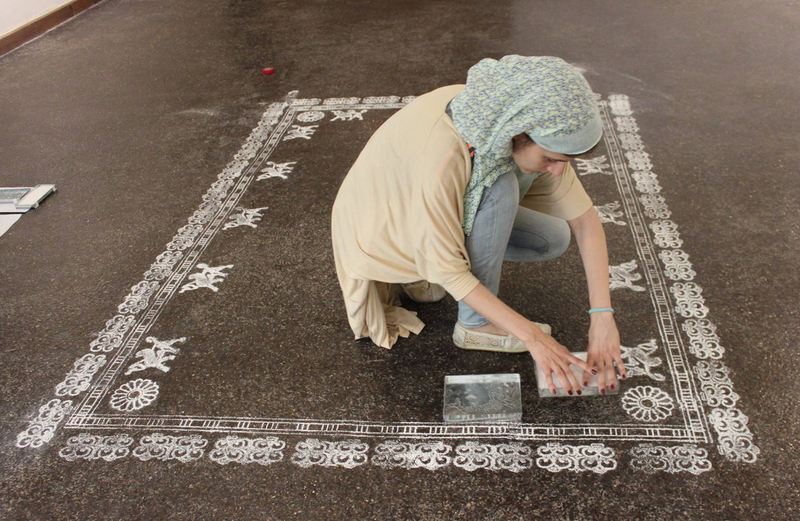 Anushka’s galvanized steel pieces were used as stencils to make Marjan’s carpet in chalk, in a piece titled “Ready-made Ruin.” This felt like the full realization of the two artists’ display and helped bring together their individual artwork. The material, chalk, itself is a symbol of the past being erased. Chalk, which is limestone, is a material whose deposits date back to the Cretaceous period around 145.5 million to 65.5 million years ago and it has a history that originates in cave drawings. It is soft, fine-grained and is easily rubbed off. What was once used as a regular commodity in schools, on black boards, is now being replaced by markers and smart boards. So an extensively old product has been replaced as society has progressed, making it the perfect material for this project and exhibition in more than one way. 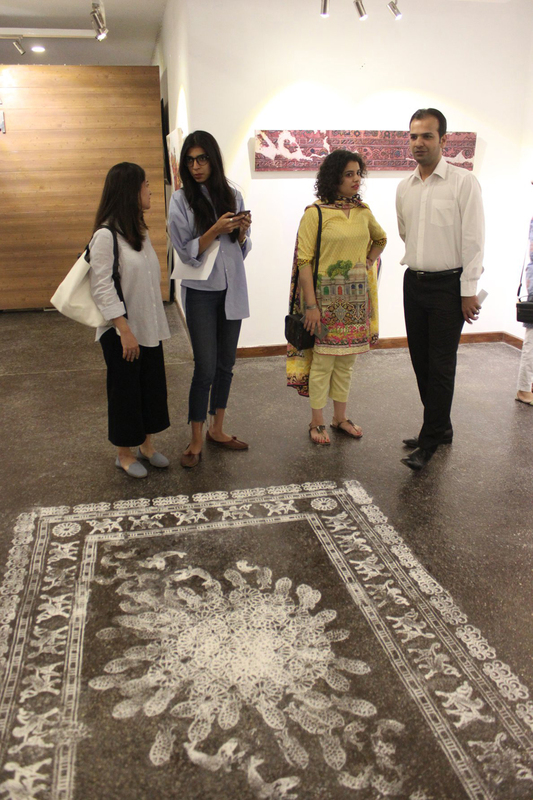 The carpet being on the floor and without any marked boundaries for the audience resulted in more than one form of interaction between the art piece and audience. People had unknowingly stepped on the work and at the opening, the carpet had begun to fade; a quite literal comment on the transitions of traditions; how everything passes away slowly without notice. Anushka Rustomji Musa (b. Karachi, 1989) is a visual artist and educator. She graduated in fine arts with a major in painting in 2012. She currently lives and practices in Lahore, Pakistan. 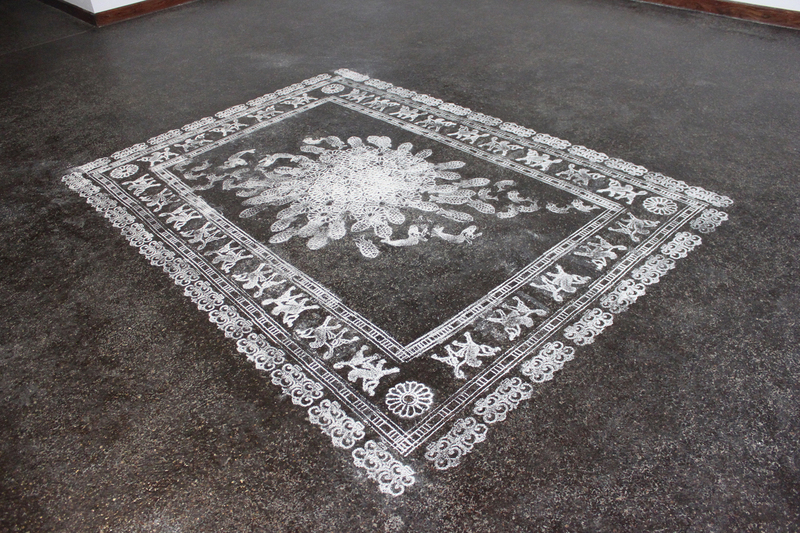 Anushka’s practice is influenced by the themes of art history and erasure, in reference to colonization. 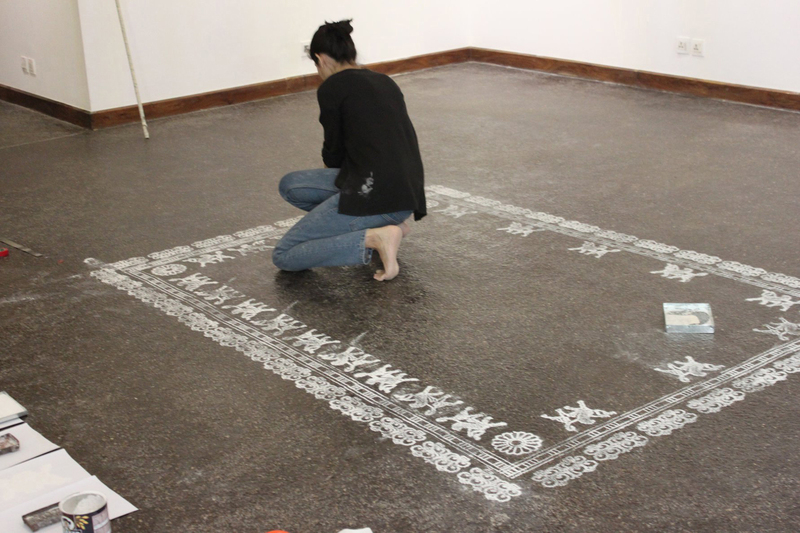 Her visual vocabulary is informed by ancient Eastern and Zoroastrian imagery, texts and traditions. She utilizes the symbolism in texts and myths to form veiled visual narratives conveying ideas of creation, survival and transcendence. Through such imagery she makes cultural and historical connotations but ultimately leaving the interpretation of meaning up to the viewer. Marjan Baniasadi (b. 1993) is an Iranian artist who did her BFA in painting (2016) and masters in visual arts (2017) at NCA and currently lives and practices in Lahore, Pakistan.